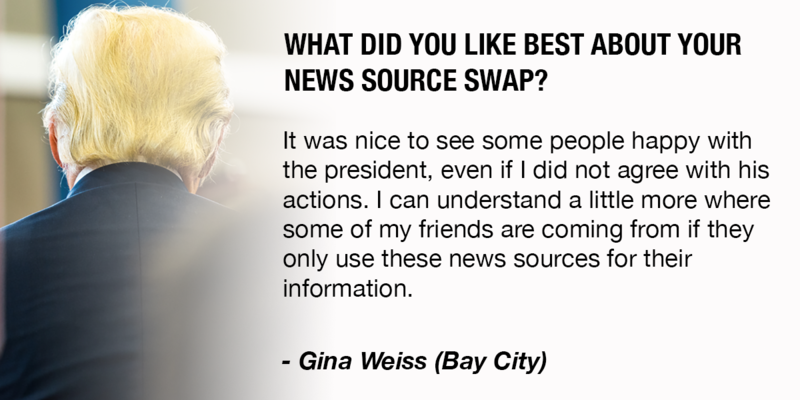 SLIDESHOW: Use the arrow above or swipe to see some of our favorite quotes from the News Bubble Swap. On a Friday in April, Kayla Miller of Marquette, Mich., performed a painful purge on her iPhone. She dropped news notifications for multiple news sources and signed off of social media. 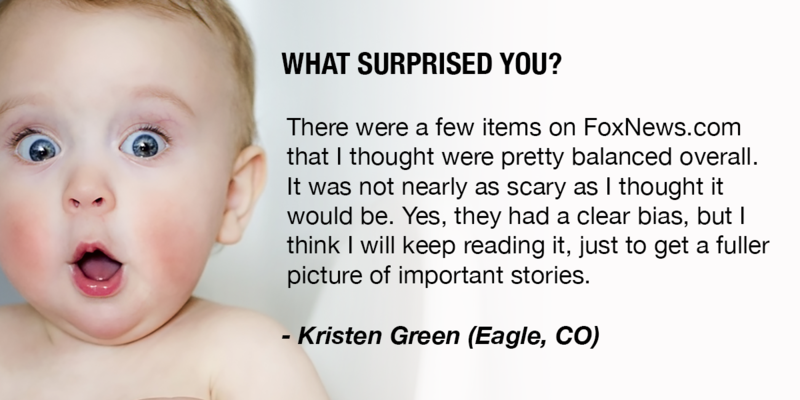 In their place, Miller added news feeds for three sources she was unfamiliar with. 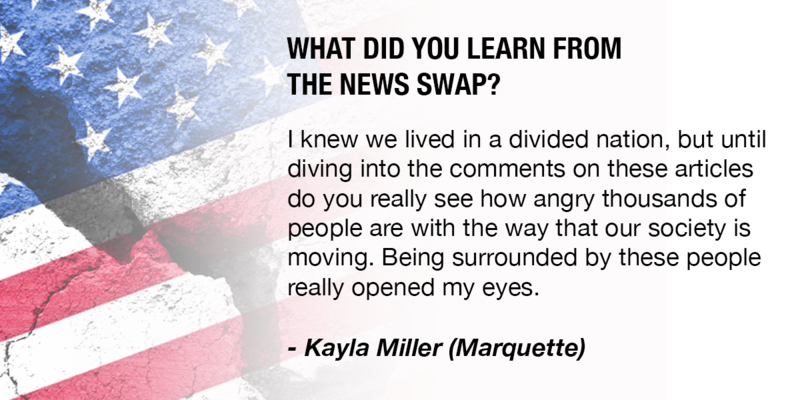 Miller was one of more than 200 people spread across all corners of Michigan, 36 states and six nations to accept Bridge Magazine’s challenge: spend a week looking at the world through the news sources of people with different political views. Their responses ranged from horror (“Propaganda straight from Goebbels”), to relief (“it wasn’t as scary as I expected”). The reaction of Miller, who just graduated from Northern Michigan University, was typical. 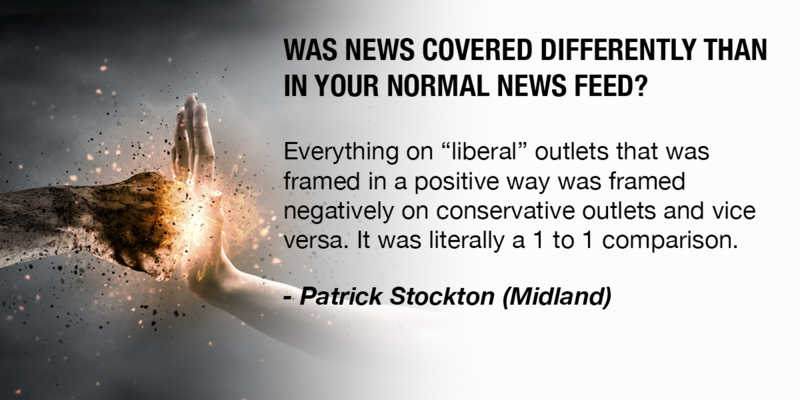 She said she felt “disappointment and sadness” reading news sources that included The Federalist the New York Post and Glenn Beck that were more conservative than her normal news diet. Yet like many participants, Miller also ended the exercise feeling something that seems rare today: political empathy. 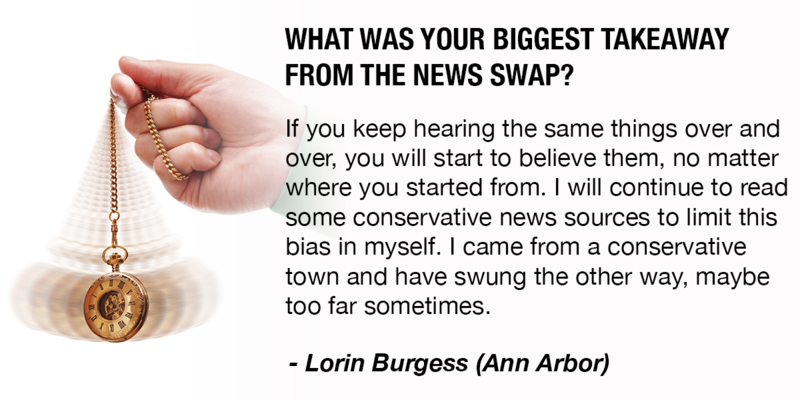 The reader news swap was prompted by an April 6 Bridge article in which a Troy conservative and two Ann Arbor liberals swapped news feeds for a week. It didn’t go well. That story is part of Bridge Magazine’s Michigan Divided project, in which we are following 11 Michigan families and residents with different backgrounds and political views. They agreed to participate as an experiment in piercing the political and cultural bubbles they, and many of us, live in. You can read about their experiences here. 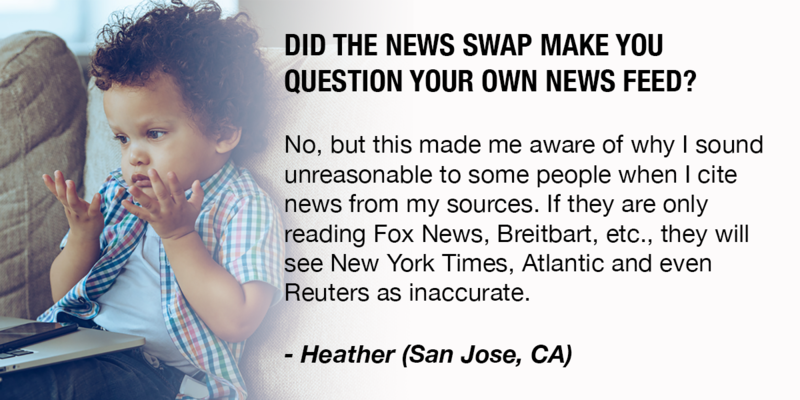 A small notice at the bottom of that story offered readers a chance to try a news swap themselves: Bridge would match them with someone with a different politically-leaning news bubble for a week. 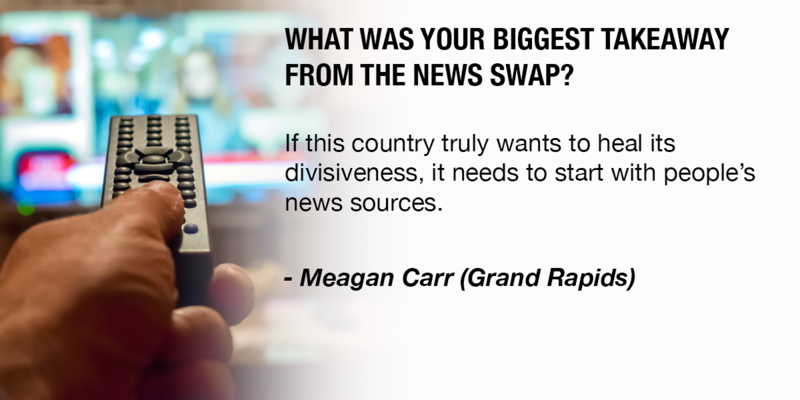 The response was overwhelming: 236 people asked to participate in a news swap. People from Maine to Hawaii and Marquette Michigan to Phnom Penh, Cambodia signed up (Readers in France, Canada, the U.K. and Australia also volunteered). 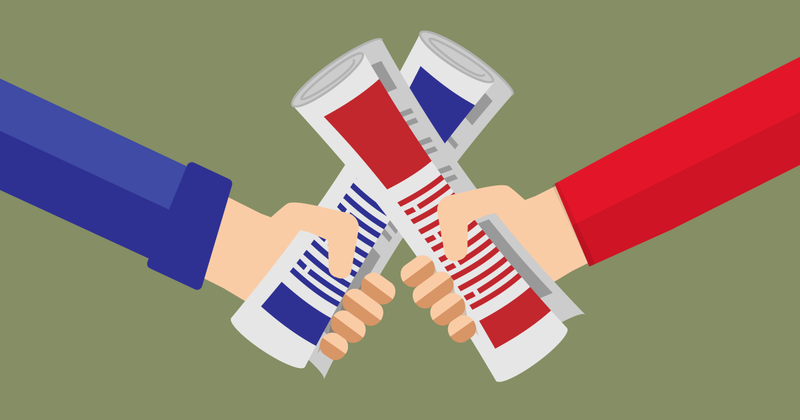 Because there were more left-leaning than conservative volunteers, many participants could not be matched with their ideological counterpart, so they were given news feeds considered politically opposite by All Sides Bias Ratings, a site that, through reader input, places news sources on an ideological scale. 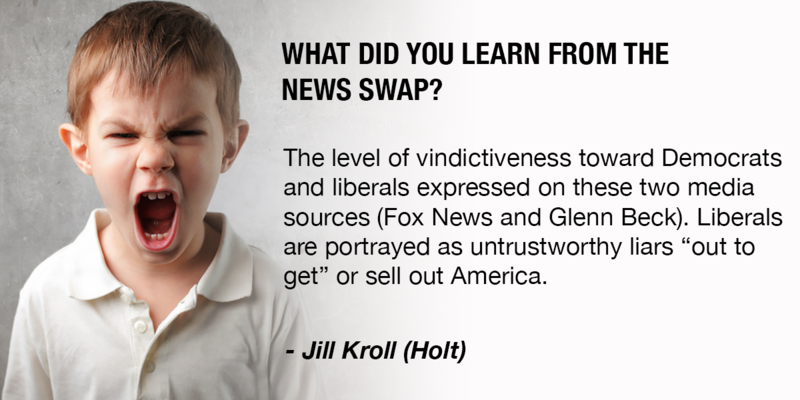 For example, Bridge matched the Washington Post, with its centrist to Democrat-leaning editorial page stance, with the editorially conservative Washington Times, and the liberal comedy news show The Daily Show with clips of conservative comedian and pundit Dennis Miller on the Fox News show The O’Reilly Factor. 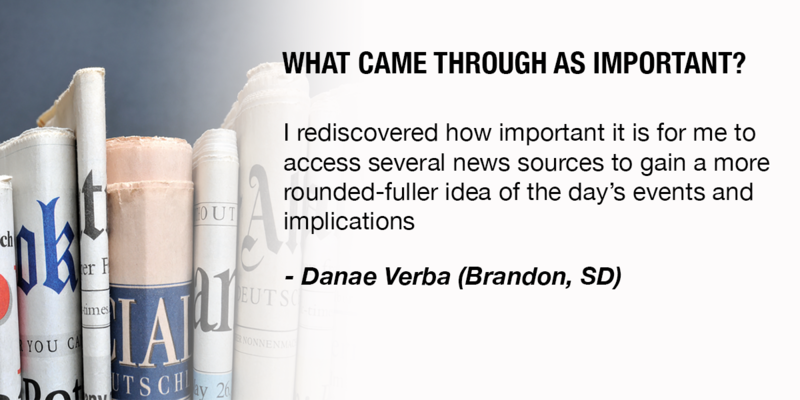 A generation ago, such an exercise wouldn’t have been necessary, since Americans had many of the same news sources; they were more likely to subscribe to the same daily newspapers, or watch one of three network evening newscasts. There was no Fox News or MSNBC. There was no Huffington Post or Breitbart. 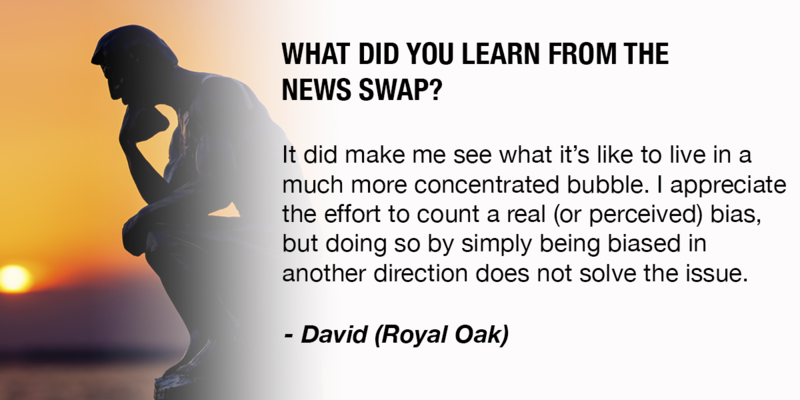 Some participants received an unexpected benefit from the news swap: time away from the news. 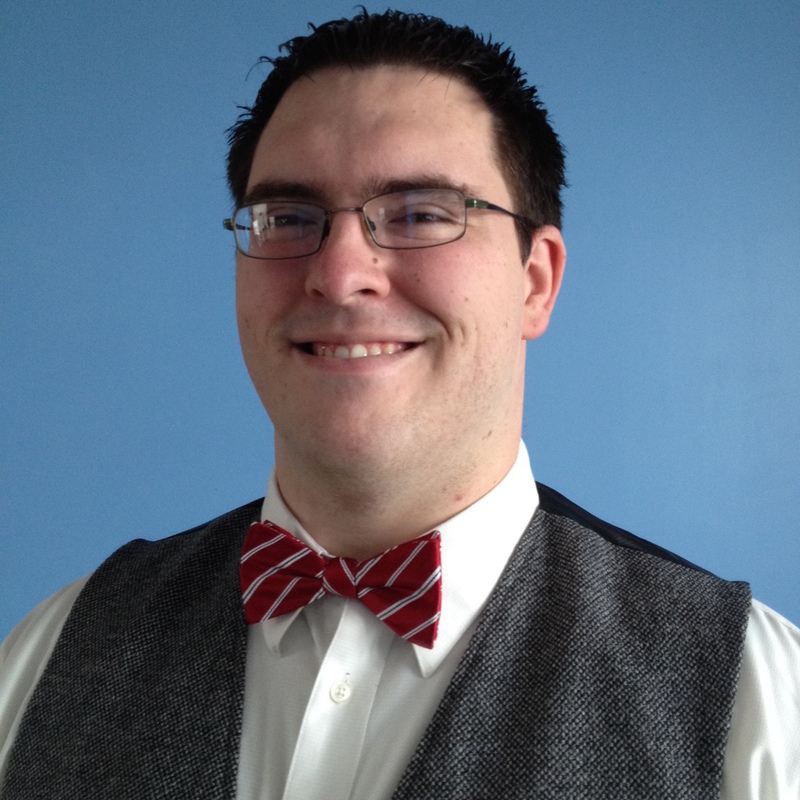 “I learned there are serious conservative thinkers, and despite disagreeing with their core assumptions, I thought their writing was clear and well thought-out.” - Lorin Burgess, Ann Arbor, Mich.
Varva told Bridge by email he is still reading the conservative news sources assigned to him for the experiment last month, which included the New York Post and the Daily Caller. “I will continue to endeavor to pierce my own bubble more frequently than I have in the past, as difficult as it may be,” Varva said. 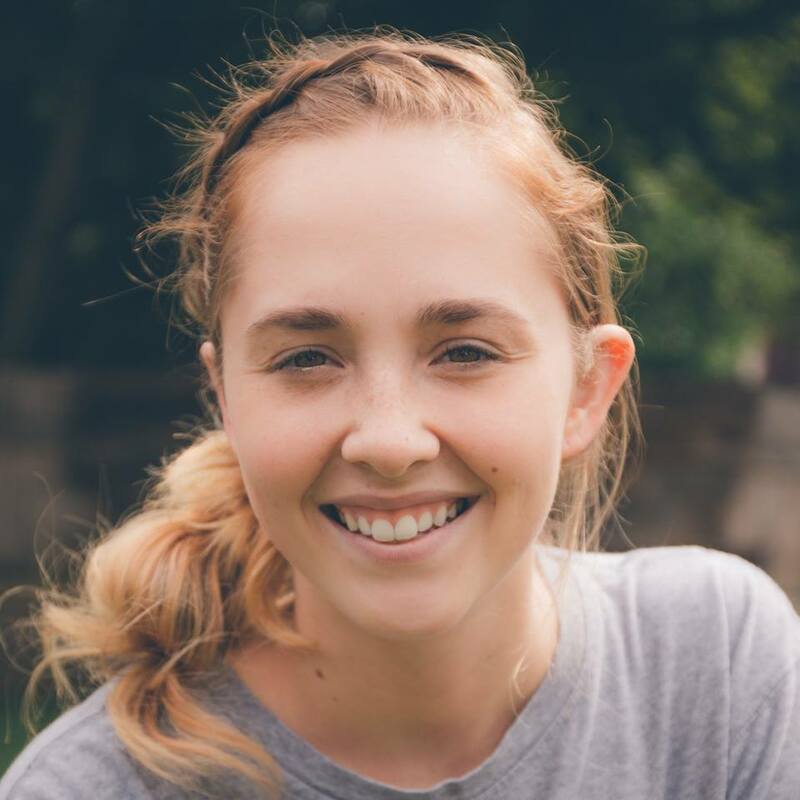 Miller, the recent NMU grad and former executive editor of the campus newspaper The North Wind, said the exercise opened her eyes in ways she didn’t expect. 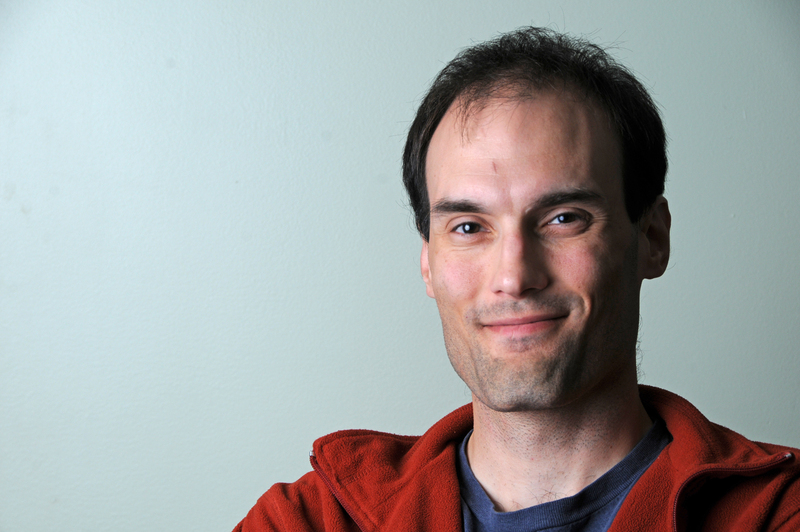 “It opened my eyes to just how small some perspectives can be, and how important it is to broaden our worldview and look outside our own way of life,” Miller said. Interactive map: What political bubble do you live in? Bridge creates Michigan’s first precinct-level map showing how your neighborhood or community voted in the presidential election. As 2017 unfolded, six families from vastly different backgrounds said they sometimes felt like Michiganders didn’t speak the same language on politics. A Bridge documentary goes in search of what they might share. 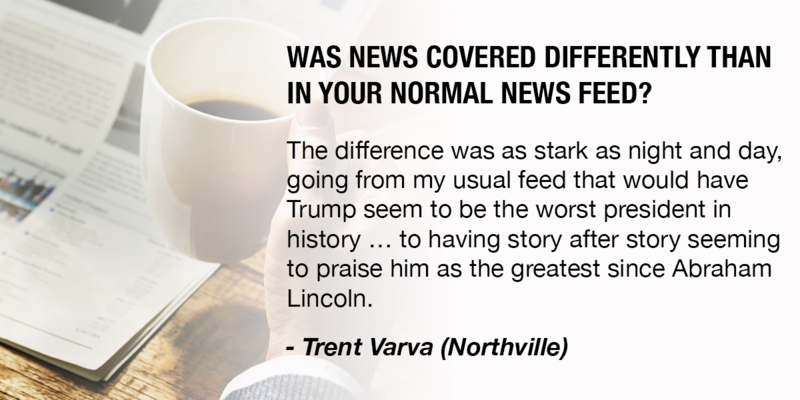 The “un-American” New York Times and the “nightmare” Drudge Report: A Troy conservative and two Ann Arbor liberals discover just how wide the news divide has become. Just curious, where does "All Sides Bias Ratings" place Bridge? I place "All Sides Bias Ratings"as leaning left. I place Bridge as Left. Ironically, AllSides DOESN'T have a rating for The Bridge. If you want non-partisan news, you have to hire a diverse group of employees, and those employees have to discuss a story before it is written. Not an easy or inexpensive task given the time and resource constraints of most news outlets. I doubt many writers worth an ounce of salt would roll over and just write what the boss dictated they should write. From reading the bios of Bridge writers, I'd say it is 90% liberal. And an interesting ad that a radio station used 60 years ago, "when you hear it, it's news; when you read it, it's history" May not apply to today's internet, but still applies to the big city printed papers. I hope you're not under the impression Bridge writers don't talk to their editors before they write. As one of the former, I can assure you we do. Did no conservatives volunteer for this round or did they not offer any follow-up feedback? It's discouraging in a way to see so many liberals willing to check their own biases and consider other perspectives when the conservatives are apparently just checking out and burrowing deeper into their own bubbles. I'm disappointed by the story. You had over 200 volunteers but only shared the comments from six of them, with no attempt to compile all the other comments and summarize them. Even though more liberals participated I'd like to hear the comments from the few conservatives that did participate. Did they share the reaction of the six individuals quoted? I hope you will share more of the comments. You seem to have a different threshold for ‘bravery.’ Where you feel it is heroic to turn off one media outlet and turn on another, I see those who go off to war to defend the right of people choosing what they listen to, what they say, and what they think as heroic. I watch CNBC [daytime, a micro MSNBC] with a some of FOX [national], I often watch ABC [evenings local in into national] and a some FOX [national], I read what Bing, Google post such as from the New York Times, LA Times, Washington Post, Wall Street Journal, I read from what Huffington Post shares [on AOL], listen to PBS and FOX on the radio and for a different perspective with a bit of humor I periodically listen to Rush Limbaugh. You tell me what I should stop listening to and reading, and what I should listen to for a week or so. I will do that if you will allow me to critique [how credible and why, how factual, how emotional, it’s political bent] what I hear and see. And then let me return to my more standard fair allowing me make similar critiquing. And let others judge what I say and think. There is no fear, no hesitation about what I listen to for when I listen I evaluate, think about what is presented and why, how it is presented and why. I am comfortable putting my views out for public comment and conversation. 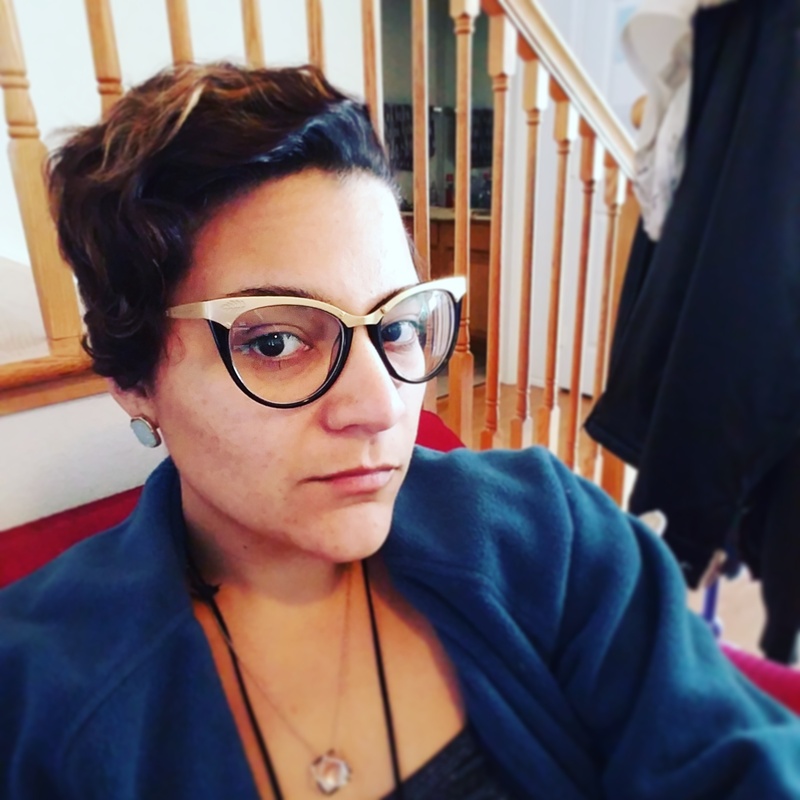 I am also comfortable answering question about me you might have to better decide how you want to design listen/reading practices. No interest, I guess I can't be saved. I wonder if a reoccurring article that a half a dozen or so with diverse perspectives pick a 'news' show or blog and each independently critiqued each show/blog, to help other see how and why people look at the news and media differently. 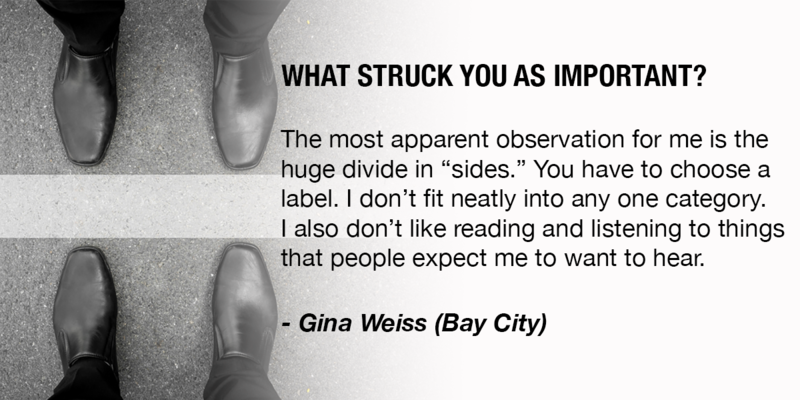 Do you think offering people side by side views from different perspectives of the same reporting and being able to be part of a conversation about the perspectives might help people become more appreciative of diversity of perspective? I find it very interesting how the different wings view and get their news. Maybe those on the right are more involved making a living or raising their family so they tend to get information in bits from talk radio which allows multi tasking as they go about their day? Further the left seems more dependent on government actions for driving their idea of advancement leading their attention to outlets advocating or at least focusing on this action, (Bridge!!!). Where for the Right this source and interest is a little more diffused and less subject to protest and whining. There's a long time notion that where you make your living explains much of your politics and interests. Where are the comments and insights from the conservatives who volunteered for this experiment? It would be helpful if you told us how many there were (instead of just saying that there were more left-leaning participants). Why not a single quote from them? Actually, I'd like to know who didn't switch back? Liberals? Conservatives? Both? How many? I, too, would like a breakout on the "more than 200" who took the invitation. Were any of them conservative? I did participate in this. While I watch different news sources, I tend to be more conservative. I also research stories if there is a bias or opinion included, regardless of who wrote it. It is amazing how much information is intentionally left out in order to support the author's leanings.